Sugar scrub cubes are a fun and easy project for beginner and advanced crafters alike. 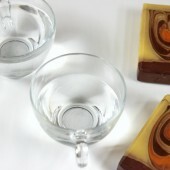 They are made with a combination of Clear Melt & Pour Soap Base, oil and sugar. 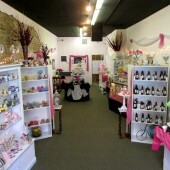 The ingredients are quickly mixed together and poured into the mold. 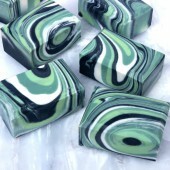 The soap base creates a texture that can be cut into small cubes. They’re soft enough to break apart with your hands and apply. 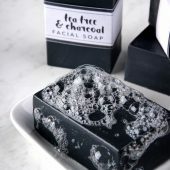 The cubes exfoliate, cleanse and hydrate the skin. This sugar scrub project is made with ingredients in the Sugar Scrub Cube Kit, which includes finished labels and printed instructions. It also ships free to the lower 48 United States! 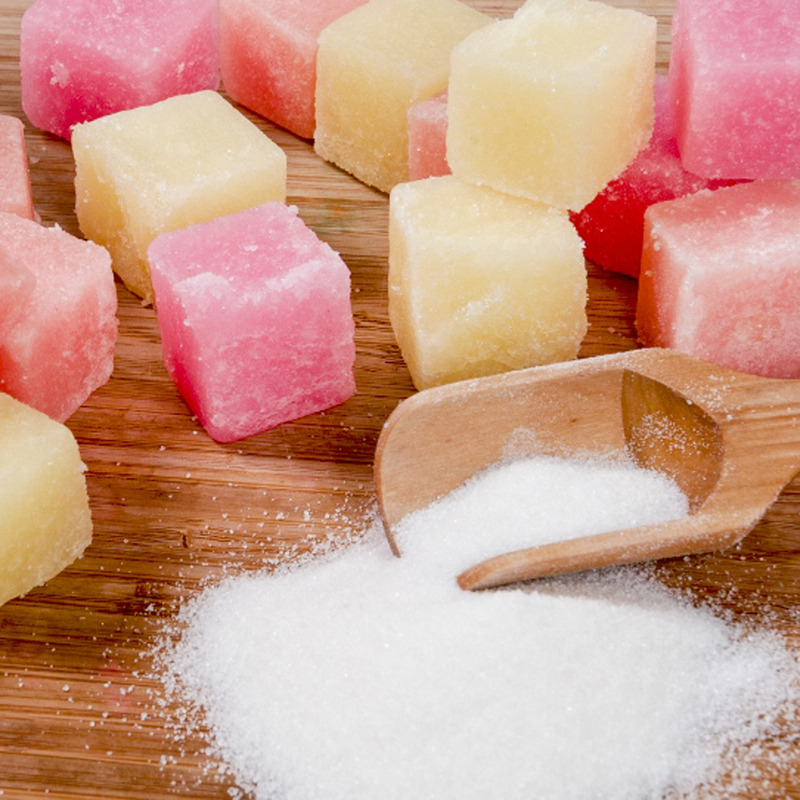 There are enough ingredients to make multiple batches of sugar scrub cubes. 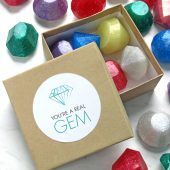 The kit also includes two shades of Color Blocks to create pink and yellow cubes. You can also mix the colors together to create orange. The key to this project is prepping the ingredients beforehand. 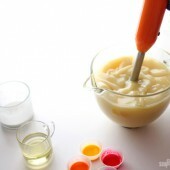 Once the melted soap, liquid oil and sugar are mixed together, the mixture begins to thicken very quickly. 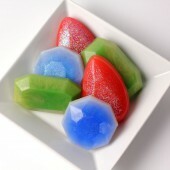 You have about 10 seconds to stir before the mixture becomes “gloopy” and more difficult to pour into the molds. If it becomes too thick to pour, don’t fret. 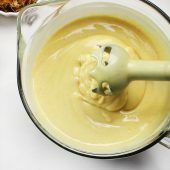 You can pop the mixture back into the microwave for about 5-10 seconds to melt the mixture and loosen it back up. Just be careful to not microwave it too much, or the sugar can start to melt! 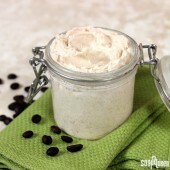 Click here to add the Sugar Scrub Cube Kit to your Bramble Berry shopping cart! 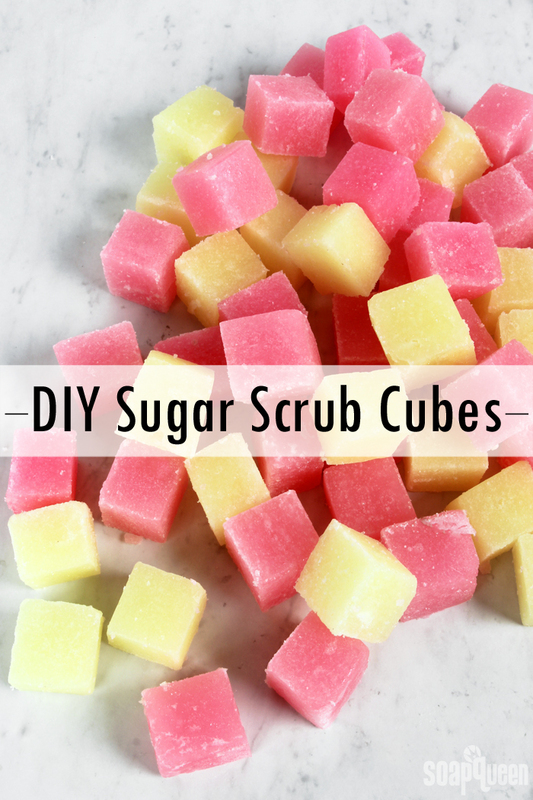 These Sugar Scrub Cubes are so easy to make! 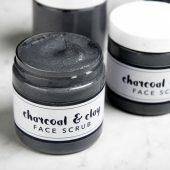 They exfoliate, cleanse and moisturize. 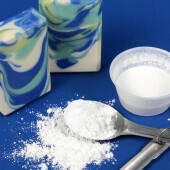 Chop 2 ounces of Clear Melt and Pour Soap into small, even pieces. Place into a heat safe container. Add 2 ounces of sweet almond oil. Measure 6 ounces of granulated sugar into a separate container. Have two Rectangle Molds with Lids ready to go, with the lids off. 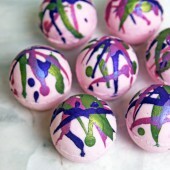 Chop off a hunk of the Fizzy Lemonade Color Block or Fired Up Fuchsia Color Block (depending on what color you'd like to make) and place it into the container with the melt and pour soap. Add 2 mL of Fresh Bamboo Fragrance Oil. 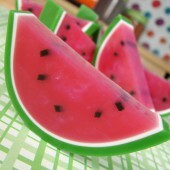 Place the container in the microwave for about 35 seconds, or until the soap is completely melted but not boiling. 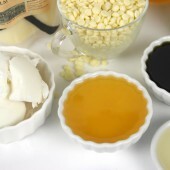 Remove from the microwave and stir to thoroughly mix together the soap, colorant and fragrance oil. Pour the sugar into the mixture and stir very quickly and rigorously for about 10 seconds. Quickly pour the mixture into the 2 molds. If it becomes too thick to pour, place the mixture into the microwave using 5-10 seconds to loosen the mixture. Don't microwave for too long, or the sugar can melt. 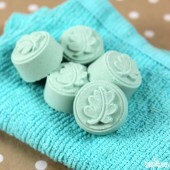 Allow the cubes to harden in the mold for several hours until completely cool and firm. Release from the mold and cut into 6 cubes. 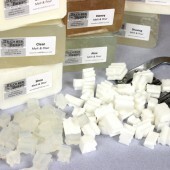 Store the cubes in an airtight package to prevent glycerin dew. 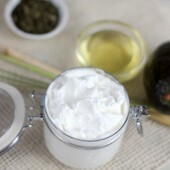 To use, break up the scrub slightly with your hand along with warm water, and apply to skin. These scrubs are great for the body, but may be a little harsh on the face. Enjoy! Hi! I made this from your recipe, minus the colorant (coz I don’t have access to the one used in the recipe). The end product turned out quite greasy/oily. I tried to use it and it has a bit of an oily residue after, not sure if it is normal. But it really is nice to use with the sugar scrub on my hands and arms. 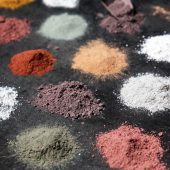 I was wondering if I should increase the M&P since I did not any of the colorant? What do you suggest I adjust for this? BTW, I live in a tropical climate and it can get really humid most of the time. However, our climate now is a bit on the cold /not so humid side when I did on the recipe. I really want to give this out as gifts but I am not sure how to adjust it. 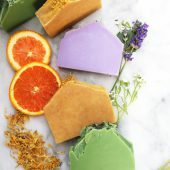 Melt and pour soaps are known to sweat in humid climates, which may be account for that greasiness you’re encountering. Try using a little less fixed oil with your project and see if they hold up better. You may also want to seal them up airtight after you’re finished so they can’t absorb extra moisture. 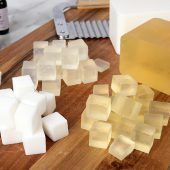 You can give that a try though it may end up crumbling when you cut it because of the sugar content and how hard the cubes are. We haven’t tried it that way – it may smush a little bit if you’re trying to cut it, but try out a small test batch and see what you think. I want to make a solid sugar scrub cube without using MP. 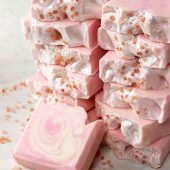 I cannot seem to find any answers 🙁 would i be able to make this same concept with a cold process and add sugar at the end, like soap? Thank you! All of your recipes are amazing! 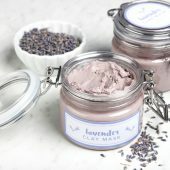 If I used your exact recipe, can you please tell me how I would list the ingredients on a label? Thank you! 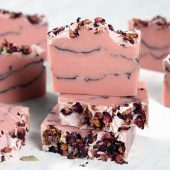 You would start with Sugar, then Sweet Almond Oil, then liste all of the ingredients for the Melt and Pour separately, finishing your label with fragrance and color. 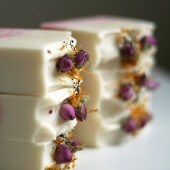 I was thinking of making this as an lemon poppyseed scrub. Would the lemon peel powder and poppyseeds would be ok to add to melt and pour? And would the lemon peel hold up scent pretty good? 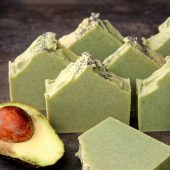 You can add both the Lemon Peel Powder and Poppyseeds to melt and pour soap as well as this recipe. 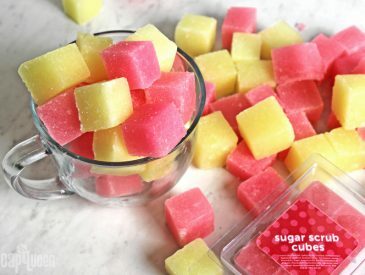 Just keep in mind that would change the scrub cubes’ consistency a bit so you may want to try a small test batch to make sure you like the results. Can I use goat milk soap instead? 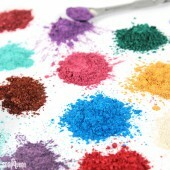 You can, but you will end up with a more pastel color with your sugar scrub cubes. 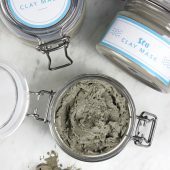 could you tell me please proportional of ingredients for basic body scrub? 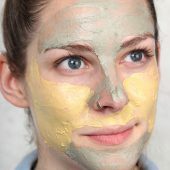 Generally you can switch out the exfoliants without having to change the entire recipe. Can you use salt instead of sugar? 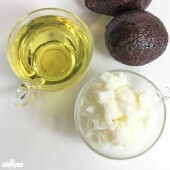 Would I need to use anything different like fractionated CO instead of almond oil? Yes, you can use salt in this recipe. 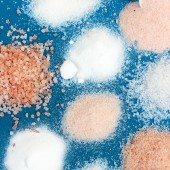 Fine Epsom or Dead Sea salt work well because they’re a similar size to the sugar. 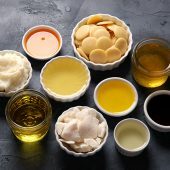 You can use sweet almond oil with the salt, but if you prefer fractionated coconut oil use that at the same amount (2 ounces). 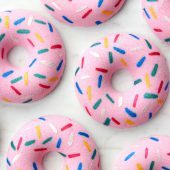 Hi,can I use food color in this recipe? 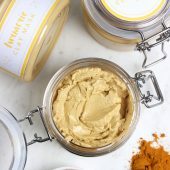 Can i use butters in this recipe? 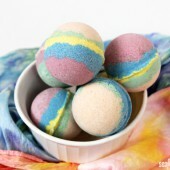 They’re softer and less cleansing than this recipe, but they still feel great on the skin. We haven’t tried this recipe with liquid soap, so I would recommend a small test batch to see what you think. 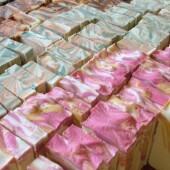 if i use more soap base & lesser oil (half the amount), will the cubes be a little harder? Yes, they will be harder. It may also be more difficult to get them mixed up and poured before they harden. I would recommend making a small test batch to see how it goes. If it’s hardening too quickly, you’ll want to add more oil. I think 6 cubes would be a good amount – that’s about 1 bar of soap. 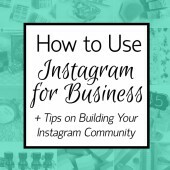 You can add more or fewer depending on your packaging, marketing, etc. My cubes are breaking apart too easily, did I add too much oil? Did you add more oil that the recipe calls for? what is the shelf life for the scrub cubes ? do I need to freeze them ? 6 months to 1 year mainly due to the Sweet Almond oil. Be sure to keep them sealed up so they don’t attract moisture form the air. We haven’t used coffee grounds in this recipe, so I’m not entirely sure how that would work. 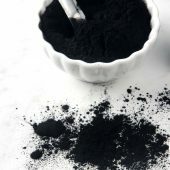 Keep in mind coffee grounds are larger grained than sugar, so they will be more exfoliating if you use the same amount. You may want to make a small test batch with coffee grounds to see how it works. I did but not in little squares and it worked perfectly. the goat’s milk doesn’t react to well here in Africa where I live, so I used a remainder with the coffee and made another layer oh the honey MP Base. it works perfectly. That’s awesome, glad they turned out well. It was so easy and fun! I love that I can buy all the ingredients and packaging through you (Brambleberry) My friends love the homemade gifts and think I’m a genius! 😂 lol. Thank you. Hi may I ask if you used coarse sugar with this recipe? I tried it with fine castor sugar and I could barely feel the grains. Thanks! We used white granulated sugar, which has larger grains that castor sugar I believe. I would recommend trying the white granulated sugar to see what you think. 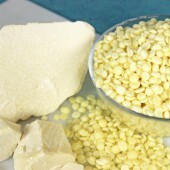 You can also use larger grains for more scrub. I’d love to try this recipe, but I have a few questions. Could I use a different MP base? Such as shea or goat’s milk? Also, could I pour these into a silicone mold instead of the plastic lidded molds? And last question, I promise, is the Sweet Almond Oil a necessity in this recipe or would the cubes hold together without it? Thanks so much for every tutorial and bit of information you post, it’s been a huge help and inspiration! You can use another melt and pour base, any one of ours will work really well. Silicone molds will work well too. 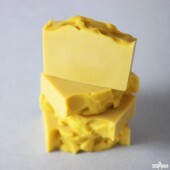 As for the oil, it helps make the cubes softer and easier to break apart. You may find the soap with sugar is a bit too firm. I would recommend a small test batch to see what you think. Instead of sugar, can I use epsom salt? What would be the ratio? 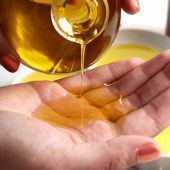 If I use virgin olive oil, and an essence oil for scent would that be okay? 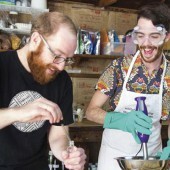 Can i melt the soap via a stove instead of a microwave? Thank you so much! 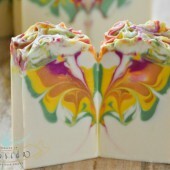 Is glycerin the only melt and pour soap you could use? 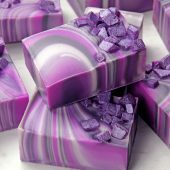 How about other melt and pour soaps? 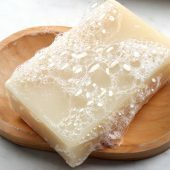 Hello Ann Marie, I tried this recipe with sweet almond oil, white sugar, clear glycerin but the fragrance was coconut, so when I made it it was white the soap now it turned light brown what may have caused this?? Is there anything that prevents using the fractionated coconut oil for applications like this? I know regular coconut oil has a solid state until 76 degrees but fractionated is liquid regardless. 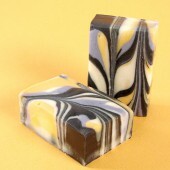 Is this one I could try to use in soap recipes if I wasn’t using almond or grapeseed? Fractionated coconut oil will work in this recipe. 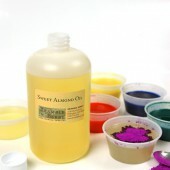 It has a different consistency than sweet almond oil, so you may want to make a small test batch to see what you think. Just received my kit and can’t wait to make my cubes! 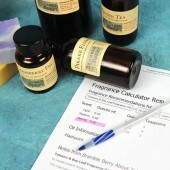 If I make 2 different scents, do you think they can be packaged together in a gift bag? Or will the scents transfer to one another? 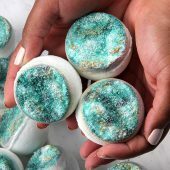 Do these dissolve when you use them like regular sugar scrubs of do they act like soap? 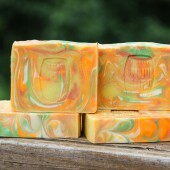 They’re a soap/scrub hybrid, so they are solid but as you use them the sugar and oil do transfer to your body. That means they will dissolve more quickly than regular soap. I made these a few days ago. I absolutely love these! They turned out beautifully! They smell divine and break down easily in the shower. I can’t wait to make more and share them with my friends and families. Glad you’re loving these Ana. I think your friends and family are going to love them too. Hi how many cubes would I get out that recipe? And can I use other melt n pour base like goats milk? 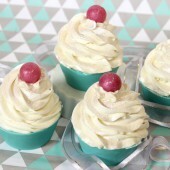 I need to make quite a bit of these and wonder how I could increase the recipe without spoiling it.. or would it be raised to just make regular sugar scrub that can be scooped? This recipe makes 24 cubes. You can use another melt and pour base and you can double or triple the recipe if you like, just be prepared to move quickly to get it into the molds. I love this recipe but I was wondering if you could substitute Coconut Oil for the Almond Oil? Would you have to use less? Thank you! I did try it and it was definitely too hard. It hurt my hands to try to crush. 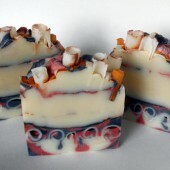 What about using white soap base instead of clear? Gotcha 🙂 I’ll stick with sweet almond. Thank you! 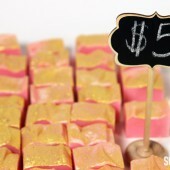 Can any other colorant be used in this recipe or does it have to be the blocks? Thanks Kelsey! I just made these and that is exactly what I noticed – oil pooling on the top. I’ll give it a couple of days and see what I’ve got! 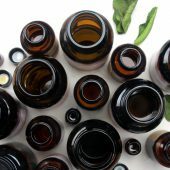 i did not find the fresh bamboo oil , is it ok if i do not use it? or can i use coconut oil ? These look incredible. I don’t have any melt and pour soap bases. 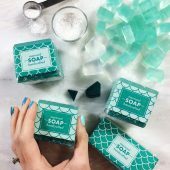 Can I use my own cold pressed soap bars instead? 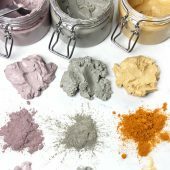 Is there a way we can make our own color blocks at home with oxides? Thank you! Do these need a preservative if they will be sold? If so, which preservative would you recommend and how much for this recipe? I have issues with oil seeping out of sugar scrub cubes when there is a lot like this recipe (defiantly beads of oil not glycerin dew). Is there any way to prevent that? I normally use sweet almond oil. In our tests we found the oil may seep out the first few days, but after that it should reabsorb in the bars! How many days has it been since you made your bars? Since it takes a few days for the oil to reabsorb that might puddle on top, is it necessary to let them cure, so to speak, for several days before they are ready to be cut and used? Yes, you can let them sit out for a few days just in case there is any oil. Keep them in a cool, dry place like a cabinet or basement. If you have a fan or a dehumidifier you can run that over them as they dry. Can this be made as a full bar instead of cubes? If you have a nut allergy could the almond oil affect you? Avocado butter makes the tub incredibly slick will the liquid oil do the same? Oil can make the tub slippery, so make sure to use caution when exiting. The soap does help wash away some of that oil though. I hate to be that person but if someone has a medical condition its best to ALWAYS refer them to speak to their doctor, no? Absolutely, we do recommend talking to your doctor with any skin or medical concerns you may have. I made these from the kit last year and I have to say I liked using them. But I had to cut them down into smaller pieces. They are pretty hard until you get them wet enough, and I found I was wasting a lot of it trying to use a whole cube in one session – they go a long way! Glad you liked using them Michael! Although the video tells when to add the almond oil, the directions (to print out for later) are missing that step. 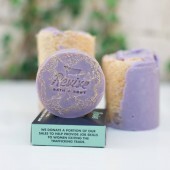 I LOVE these – so nice and scrubby but also cleansing. So glad you’re loving these Lisa! We got the sweet almond oil directions added. Sorry about any confusion. Can I use any type of mold or does it need to be plastic?